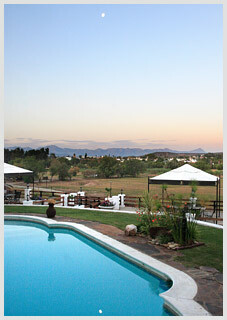 Terra Bianca rests on the banks of the Grobbelaars River, overlooking Oudtshoorn and the majestic Swartberg Mountains. This establishment offers visitors one of the most spectacular views of Oudtshoorn and surrounding areas. Experience farmstyle living in the middle of Oudtshoorn at Terra Bianca. A beautifully landscaped garden surrounds this Cape Dutch gabled home. Relax in a sparkling Victorian swimming pool, enjoy sundowners on one of the two roof terraces or simply while away the time bird-watching. • Tea and coffee tray.